A repositioning campaign to change everything you thought you knew about SPAM, so that maybe next time you're cooking Asian food you'll give it a go. SPAM in the UK is seen as a pale slab of meat you'll find at your local cafe. What most people don't know however, is that in many Asian countries they've been pioneering it for decades to create mouth-watering meals that look delicious. There's another thing we Brits, on the whole, aren't aware of either - Asian languages. To create curiosity, confusion and a platform of interest Chinese and Korean ads will appear across the UK. Standing out among a sea of purely British ads, they'll leave people wondering what the heck they're on about. Of course some people will be able to understand the text. There's an underlying narrative that too many people are finding out about how delicious SPAM tastes in Asian cuisine. It then begs the reader not to tell anyone as it's causing SPAM's factories to struggle. Where long copy isn't suitable, the adverts simply spread the message of SPAM and Asian food being a match made in heaven. Once confusion has reached a maximum, we'll lift the lid on what these posters actually say through PR channels. SPAM will also team up with Google Translate to give people a chance to translate the posters themselves - while also helping to promote Google's new live-camera-translation feature. Digital versions of the ads will also seemingly 'break' to reveal the English translation. An alternative SPAM packaging will also be made and this 'edition' will be shelved in the oriental isle of the supermarket. SPAM could sponsor posts on popular social media cooking channels like 'Tasty' to promote delicious Korean SPAM recipes (of course entirely in Korean). 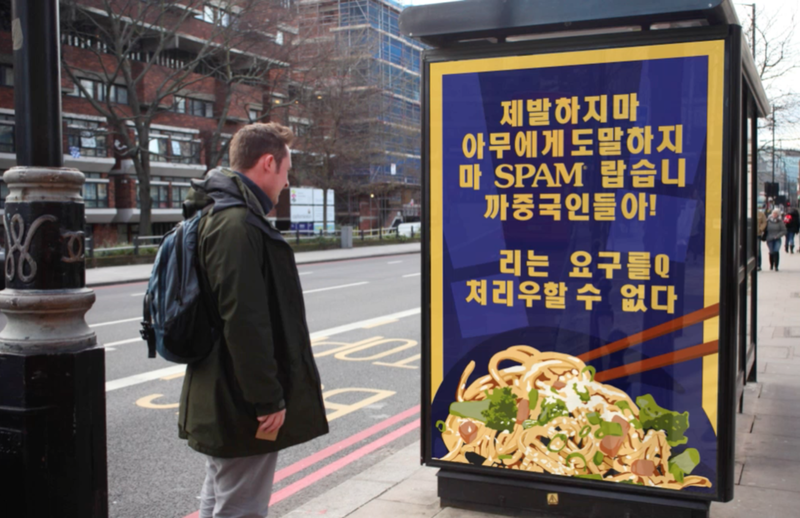 SPAM could create completely Chinese radio adverts, where the only recognisable word is 'SPAM' to further embed the link between SPAM and Asia. SPAM could also take this into TV using subtitles, disrupting the flurry of English sofa and car ads. Finally, Britain's first SPAM restaurant could pop up in China Town to serve delicious Chinese SPAM dishes and cook up some great PR.